Please see below for a Spring Internship opportunity open to Juniors and Seniors. Please click on the link for more information about this opportunity. 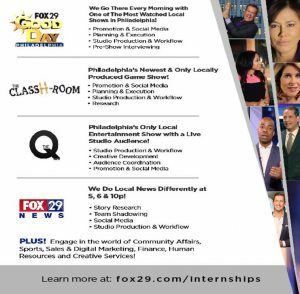 Fox 29 is looking for the brightest college students in our area, to join our team this Spring Semester for the best internship in Philadelphia. This is your chance to learn from Top Industry Professionals, interact with Producers, Anchors, Reporters, Directors, Photographers and Editors on a daily basis. This is hands-on experience. We don’t ask our interns to make copies and fetch coffee! You will be part of “the team,” as you learn from the best in the business. Please visit the links after each position for more details on how to apply and other important information. 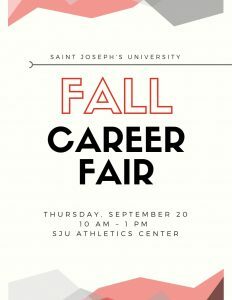 Does the Career Fair have you thinking about your future? A number of job openings and internship opportunities are currently available with FRONTLINE, an investigative journalism organization that questions, explains and changes our world. FRONTLINE is looking for creative thinkers with a passion for investigative and accountability journalism to join their team. Crash Course in Community Organizing – this Sunday, September 9 from 12:30-5 PM in Mandeville 123 | If you are interested in working for social justice in Philadelphia, join Power U, a network of students from SJU, Cabrini, Villanova, and LaSalle, working in collaboration with a Philadelphia and faith based group, Power. Sign up for Sunday’s crash course by filling out this brief form by Friday, September 7. Hawks for Just Employment – Join a student organization that strives to advocate for workers’ rights, living wages, and safe working conditions for workers on campus, all rooted in the Just Employment Policy. Contact student leader Stephanie Mignogna at sm642062@sju.edufor more info. Ignatian Family Teach-In for Justice – November 3-5 in Washington, DC | This annual gathering for members of the Ignatian family is a powerful opportunity to learn, reflect, pray, network and advocate together, all within the context of social justice and solidarity. Apply for SJU’s delegation (25 spots available) by September 13 at 5 PM. Be sure to fill out the Application to apply. 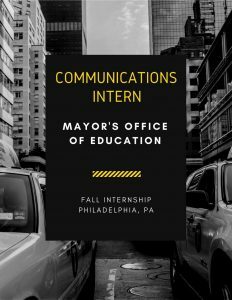 There is a new internship opportunity available within the City of Philadelphia! This fall, spend your time working on the city’s exciting future of education with the Mayor’s Office of Education. Tasks include crafting and scheduling social media content, assisting with the creation of press releases, and even attending press and public events. Visit the LinkedIn Easy Apply link to access additional information or apply! 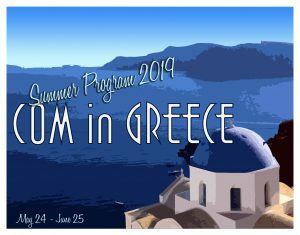 This summer, the Office of Marketing and Communications will have a mix of work study, paid and for-credit internships available, totaling somewhere between 6-10 students. If you know of any Communication majors that are looking to stay in the area for the summer, please encourage them to apply. We will also post for the fall later in the summer as well! Saint Joseph’s University’s Office of Marketing Communications is seeking talented, enthusiastic individuals looking to gain experience in the varied field of marketing communications for our summer intern team. The SJU Marketing Communications office shapes the image of Saint Joseph’s University through storytelling, design, marketing campaigns, social media and web communications. Join our team, and build your resume with hands-on experience. Members of the intern team will work on a variety of projects and daily tasks, including developing social media campaigns, writing news stories and marketing copy, conducting market research, updating media lists, creating videos, editing webpages, contributing to design projects and more. Interns will work collaboratively on projects with one another and members of the Marketing Communications team. Professional development such as training, lunch-and-learns and mentorships will be available.